As the development site was in close proximity to both a landfill and a garage a contaminated land planning condition was attached to the decision notice for the development of the site. Demeter Environmental were commissioned to prepare a desk study report for the subject site, which identified part of the site as a landfill. 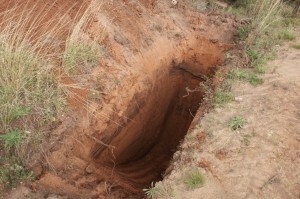 In order to fully characterise the landfill a number of trial pits were excavated in the landfill to determine if any in-filling had taken place. The intrusive works demonstrated that the landfill was not a credible source of contamination and the desk study was sufficient to discharge the contaminated land planning condition. The desk study report can be accessed from here and the memo accepting the report form here.